Unlike our traditional Handheld Seal Embosser, this Soft Grip Handheld Embosser offers a layer of rubberized gripping for optimization of the embossing process. Great for all hand sizes, this Soft Grip Handheld Embosser could be a great addition for notaries who may need a bit more cushion or help when embossing a document. The rubber grip is sure to decrease the strain in your fingers while embossing. Contact Us to find out if this is the correct product for you. Our Soft Grip Handheld Embossers were created for those in mind who enjoy the feel of a traditional handheld seal but need a little extra assistance. Made with the finest precision parts, our Soft Grip embosser is guaranteed to make embossing a breeze. Customized dies are attached to the chrome-plated nickel clip and inserted in the embosser for easy use. By the end of the day as a notary public your hands are probably aching and sore from all the documents you have notarized. This revolutionary soft seal embosser is completely made with the end-user in mind. The rubber grip allows you to firmly grasp the handle and emboss with less effort than our traditional hand held notary seal and is fit for any hand size. It is light, compact and attractive. 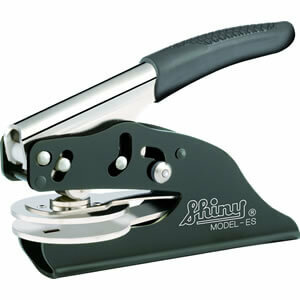 If you are a busy notary, this soft grip notary embosser is a must-have product!